The development by means of cooperation, an exchange of knowledge and education is of crucial importance in the contemporary knowledge-based economy. 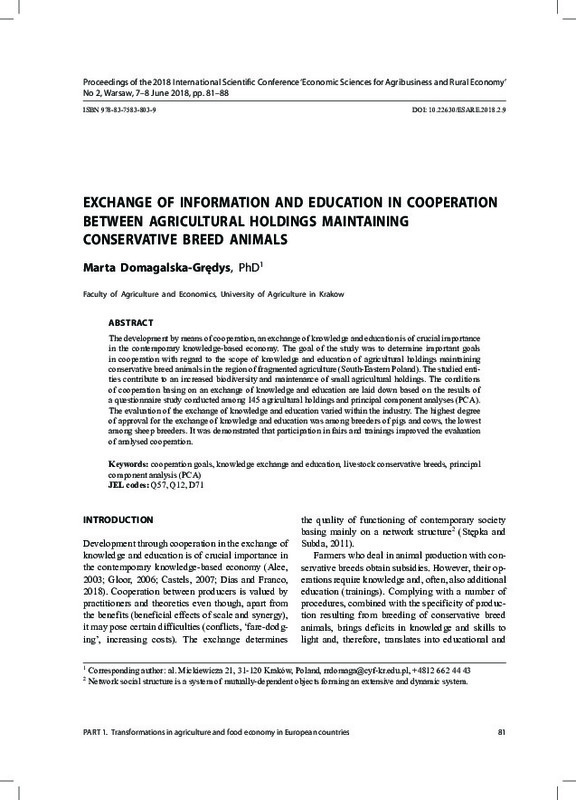 The goal of the study was to determine important goals in cooperation with regard to the scope of knowledge and education of agricultural holdings maintaining conservative breed animals in the region of fragmented agriculture (South-Eastern Poland). The studied entities contribute to an increased biodiversity and maintenance of small agricultural holdings. The conditions of cooperation basing on an exchange of knowledge and education are laid down based on the results of a questionnaire study conducted among 145 agricultural holdings and principal component analyses (PCA). The evaluation of the exchange of knowledge and education varied within the industry. The highest degree of approval for the exchange of knowledge and education was among breeders of pigs and cows, the lowest among sheep breeders. It was demonstrated that participation in fairs and trainings improved the evaluation of analysed cooperation.